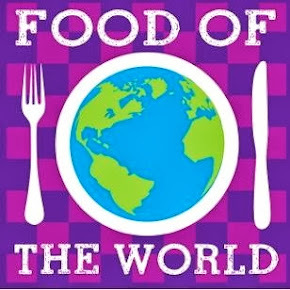 I am so excited to participate today in a new party, Food of The World with Diane at Simple Living and Eating. We will be visiting a different country every month and taking a look at their customs and food. Our first stop is Spain, and what a fun country to start with. For our first stop I am presenting a very popular Tapa from Spain, Catalan Aubergine. Tapa's are a great tradition in Spain, it is believed that the founder of the Tapa's tradition was King Alfonso the 10th. He actually issued a decree that Taberna's (bars) serve a little food with each glass of wine, what a great idea he had. Tapa's are no longer required by law in Spain, however it it a custom and tradition that the Spaniards have not intention of giving up. The custom is to visit several Taberna's in an evening sipping wine and nibbling the wonderful Tapa's that are lining the bar tops. The Catalan Aubergine Tapa that I am presenting today is a common starter in Spain that you might find in any Taberna that you and your friends might be visiting. I have really enjoyed taking this tour of Spain with you and so happy that you stopped by to enjoy these tapa's with me today. Hope you have a great week and hope to see you soon! It's so beautiful Miz Helen. .. I didn't know Tapas was a law.. lol. but it is pretty smart to eat when drinking. Maybe the king wanted to cut down on drunkeness? Well, it is great to have you on board with this I will look forward every month to what you share. My first thought was...I don't know about this...but by the end especially when you said serve with crackers, it sounds pretty good. Thanks for sharing the history of Tapas! Wow! what a tapas, that looks amazing. A lovely combination of flavors! Miz Helen - you outdid yourself! !